Greetings, we have been awaiting for you, sit and rest as you read through our scrolls of Liten Drake. 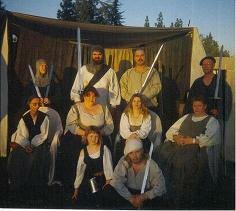 Liten Drake is an Medieval Re-Enactment Society, recreates the time period between 600-1600 c.e. We are located in California. We hope that you will view our scrolls and decide to visit us in the near future, or become an member of Liten Drake, until then.... Fare thee well.